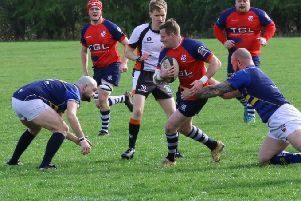 Player-coach Matt Goode is looking for Banbury Bulls to keep the pressure on Old Centralians right up until the final game. It looks as though the race for the play-off spot in Wadworth 6X South West One East will go right down to the wire. Just four points separate second-placed Centralians and Bulls and both clubs will be expected to pick up maximum points again this weekend. Bulls entertain Trowbridge at the DCS Stadium while Centralians take on Oxford Harlequins. Goode said: “We can only control what we do so we’ll be looking for another five points. If we play the way we want to play, teams will find it hard against us, but we need to get our heads on mentally. There will be more changes with Joe Winpenny, Ed Berridge and Dan Brady unavailable but Nick Pratt returns along with Callum Horne, Sam Stoop and Ed Phillips. Looking back on Saturday’s success at Swindon, Goode added: “Everyone put in a shift and stuck to their task.